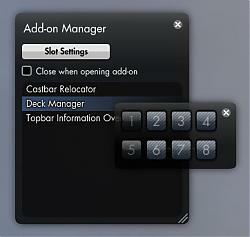 Wonder if it is possible to add offset for all options, for total customization of what you want where on the bar? And maybe color schemes for FPS aswell as the latency? Sure it's possible. Right now it's just not a priority though. 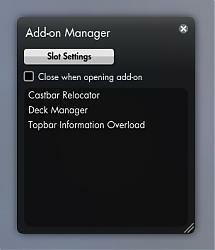 For the time being I consider Topbar Information Overload to be "done." This is not to say that I won't go back and add more things, but just that I want to move on to more important things now that the add-on works really well and fills the need of what most people want. So yeah, it's all about prioritising my time. Hi, first off, nice work. But i am new to this. 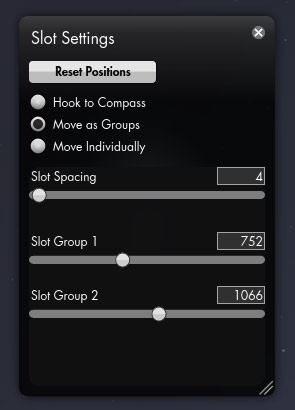 So the latest patch breaks the customized folder. so i tried again, this time copying the code direct from your files. the top bar is completely empty aside from menu and compass. Fixed my issue, the game now overwrites the flash files in the \Default\Flash directory while patching, workaround is to recopy the flash files after patching but before starting the game. Tried one other mod (Falira's dps meter) and the topbar dissapeared, removed all files and xml modifications of the dps meter but can't seem to get the top bar back. I quit the game and deleted (renamed but deleting will work) the Modules, CharPrefs and LoginPrefs bxml < Don't delete the xml files! from my Data\Gui\Default folder, restarted the game and all works fine now. Last edited by Yite : 07-19-2012 at 06:33 AM. Ok so im having a slight issue here..
i get the botton in the dropdown menu, but nothing happends once i click it..
i got .XML in the customize folder and from what ive been reading here it should be correct but it still not working, been restarting the game over and over again to try and reload it. You rock! I'll give it a go! Last edited by antarek : 07-18-2012 at 01:57 AM.